Walking through our gates one can immediately feel the calming influence for which Root Institute is renowned. This feeling of peace arises from the blessings of many special lamas who have visited us, and the serene presence of many holy objects. Everywhere you look your eyes can feast on our precious and holy objects. 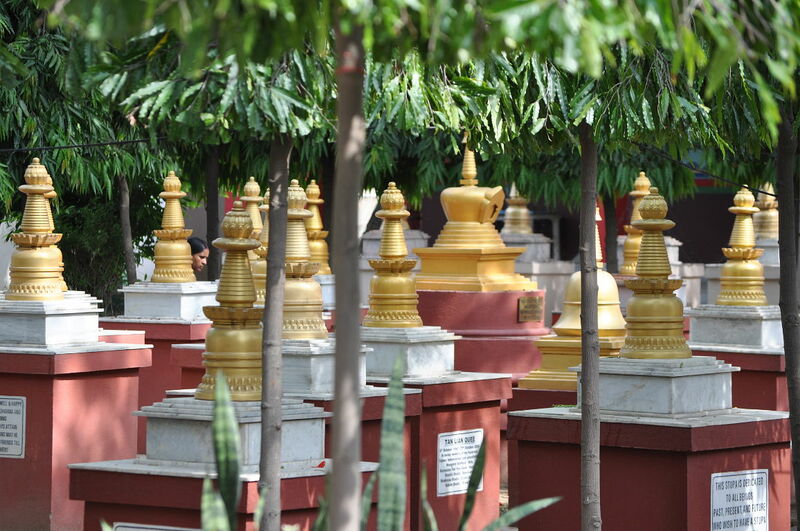 Our gardens contain many golden stupas, the embodiment of enlightened body, speech and mind. Students from around the world have sponsored these small stupas in order to benefit their loved ones who have died. 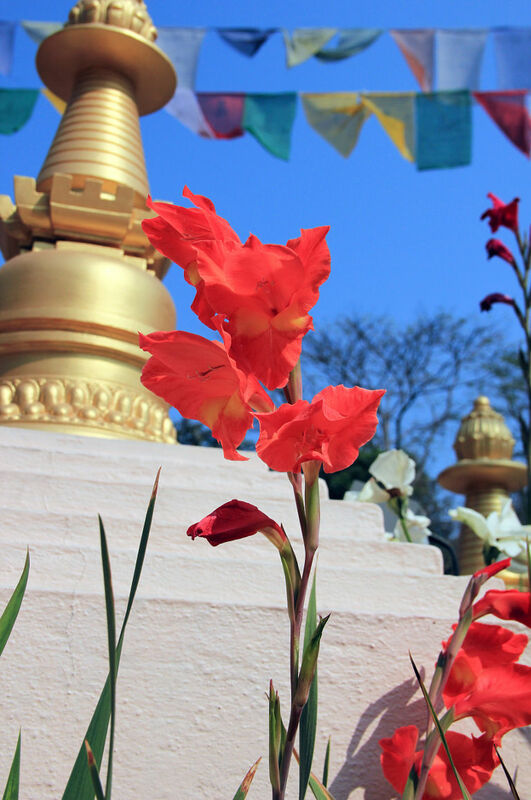 In among the stupas are the statues of Shakyamuni Buddha, Tara, Namgyalma, Arya Nagajuna and Maitreya Buddha. Beautifully painted in traditional Tibetan form, it is common for students to make offerings of khatas, flowers, water, incense and candles to each statue. These holy objects are reminders of our own inner potential, a lovely inspiration for our practice and a blessing for our minds. 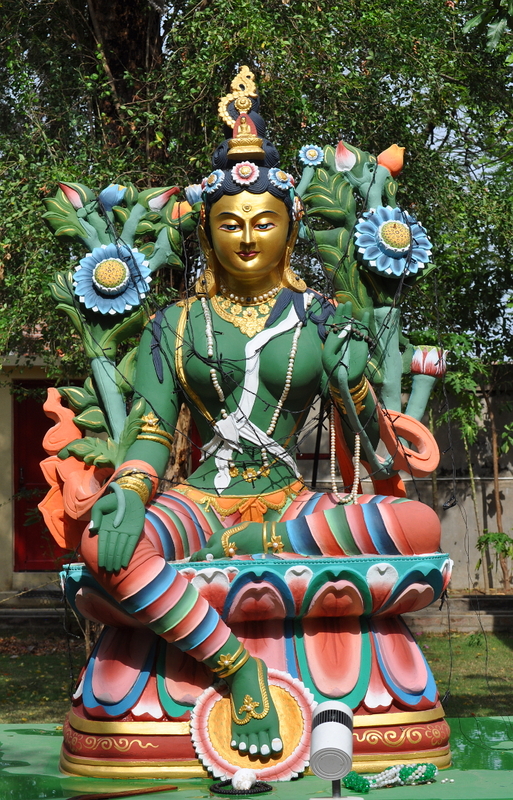 The glorious statues of Arya Nagajuna and Maitreya Buddha stand watch as you enter the main courtyard. In the second century Arya Nagajuna was a renowned scholar in the ancient Nalanda University and founder of the Middle Way school of Buddhist Philosophy. 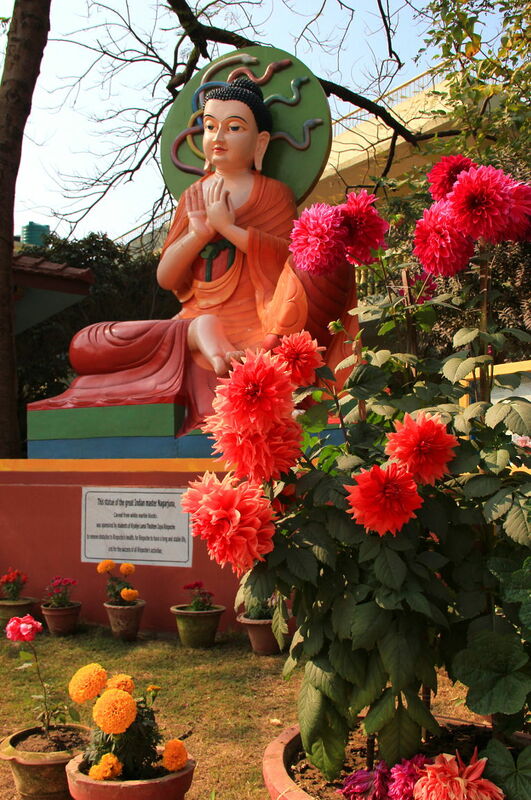 The statue Arya Nagajuna was commissioned by students of Kyabje Lama Zopa Rinpoche on advice of Rangjung Neljorma Khadro Namsel Drolma (Khadro-la) for the removal of obstacles for Rinpoche's good health and long life. The ample black marble altar surrounding Nagajuna is often used for hundreds of offerings of water bowls, flowers and lights. The great golden statue of Maitreya Buddha watches over our Main Gompa, blessing each sentient being who journeys past. It also honours Shakyamuni Buddha’s foretelling of the coming of Maitreya as the fifth universal Buddha in this world age. It is Maitreya who will again turn the wheel of Dharma to benefit all sentient beings during a time when the Dharma teachings no longer exist. Each evening students often complete mantra recitation while doing kora (circumambulation) around the statue of Maitreya. 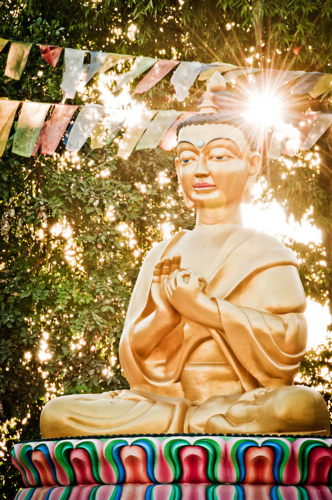 Our Spiritual Director, Kyabje Lama Zopa Rinpoche, has often recommended such practices for those who are wish to overcome certain difficulties in life. Circumambulation not only purifies our negativities but helps us accumulate merit as well. Our crowning jewel, the glorious red prayer wheel, slowly spins around, each time with a single resonating bell tone. Within the colourful wheel resides millions and millions of precious mantras and prayers. To develop compassion for all sentient beings, one can turn the prayer wheel and chant the Chenrezig mantra: the long dharani, Om Mani Padme Hum, or the 11-Face Chenrezig mantra; any of those. For those who have life obstacles or sickness such as cancer or some life threatening disease, they can turn the prayer wheel and chant the Chenrezig mantra: the long dharani, Om Mani Padme Hum, or the 11-face Chenrezig Mantra; any of those. 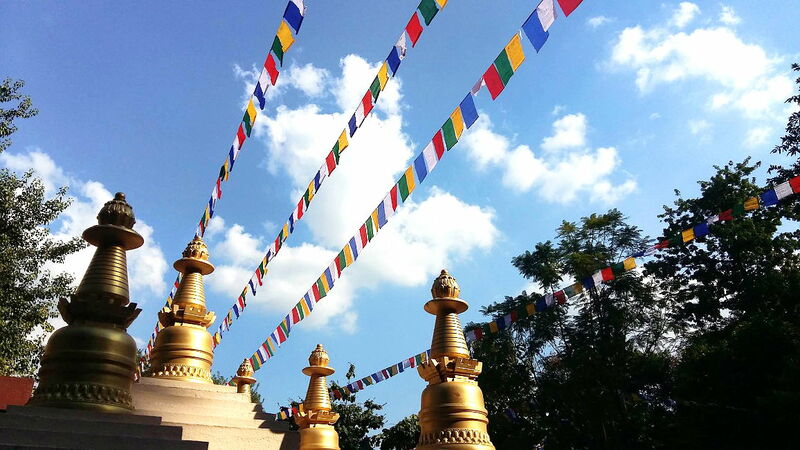 For those who want to purify negative karma, they can turn the prayer wheel and recite these mantras – Mitrugpa, Kunrig, Namgyalma, the Lotus Pinnacle or Amogapasha (wish granting wheel mantra) and the Stainless Pinnacle mantra. The prayer wheel is a manifestation of the Compassion Buddha’s holy speech. Through this practice one then achieves the holy mind, holy body and all the qualities of the Compassion Buddha... Simply touching the prayer wheel brings great purification of negative karmas and obscurations. Turning a prayer wheel containing 100 million Om Mani Padme Hum mantras accumulates the same merit as having recited 100 million Om Mani Padme Hum. In those few seconds you perform so much powerful purification and accumulate so much merit. So from the heart I offer my thanks to those who engage in the prayer wheel practice and inspire others. Thank you very much.